Although I was excited about the pattern and pleased to have been able to purchase the identical yarn (The Fibre Company Acadia in Strawberry and Amber), something else always managed to catch my knitting fancy and I never started the project. A few days ago, while my brain was still on holiday (read my last post), I decided, rather foolishly, to cast this on. I was met immediately with a simple road block. The cardigan is knit from the top down, utilizing a provisional cast-on with the pink yarn. I have of course used a provisional cast-on before, but not very often and truth be told, I couldn’t remember how to do it. Well, as we all know, this is exactly why search engines were invented. Q: Provisional cast on seems like a lot of trouble–is there another way? Yup, I think so. I myself hardly ever use a provisional cast-on. 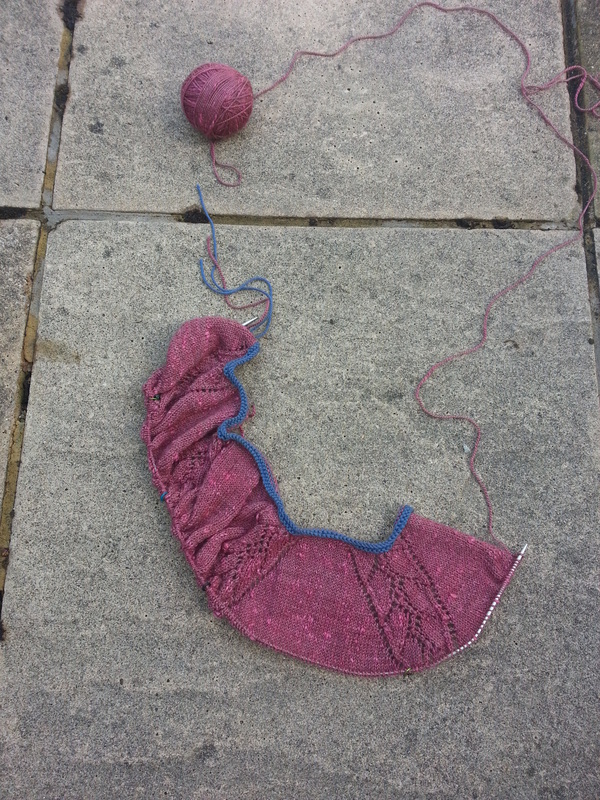 Instead, using waste yarn, I make a regular cast-on and knit a couple of extra rows. Next, I switch to the “real” yarn. 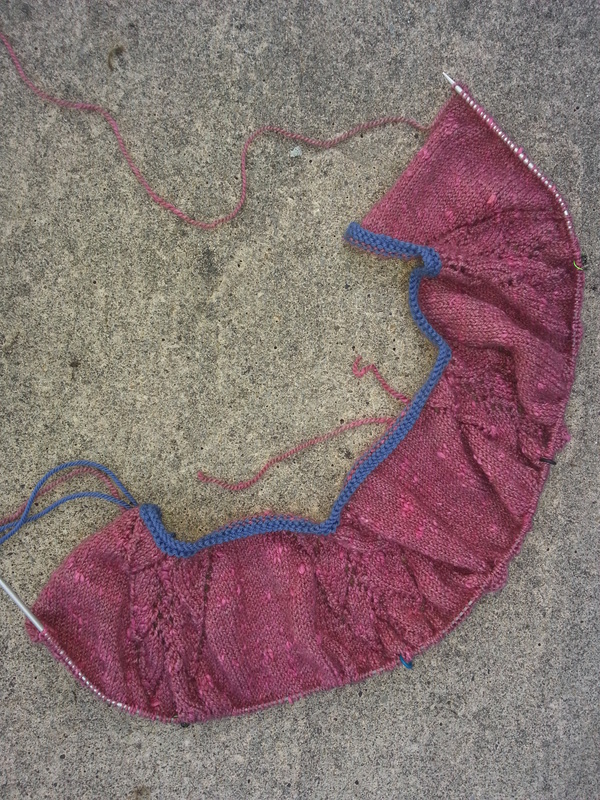 When done, I snip one stitch of waste yarn, ravel it out, and there are loops of real yarn waiting to be picked up. These loops are nice to work with because they’re tensioned perfectly to the fabric. In other words, because the real yarn loops come from a couple of rows into the fabric, they aren’t distorted by the casting-on. The blue yarn is the little bit of scrap yarn I picked up around the house. It will be cut off later, and the stitches will be slipped back on the needle so that I can knit the trim with the amber coloured yarn. Fantastic! Believe me: You will make your life so much easier if you take a bit of advice from the experts! This entry was posted in Main and tagged Enchanted Rock cardigan, Jennette Cross, Knitting, provisional cast-on, TECHknitting, The Fibre Company Acadia by knitigatingcircumstances. Bookmark the permalink. It’s amazing, isn’t it? So very simple and yet it makes so much sense. thank you for reminding me this is exactly how I was taught to do this, from my old knitting teacher. She does not read english (American) patterns, and she does it ‘her way’. I used to think she was old-fashinoned, but in fact she has a lot of techniques up her sleeve. Good luck with the rest of the sweater.What buttons are you going to use? Were these also included with the yarn? I know exactly what you mean; we can learn a lot by paying attention to these “old fashioned knitters” who know many good tricks. I bought really great hand made wooden buttons for this. Interesting…but what do you do the stitches you pick up after you unravel the waste yarn? Hi, you use a provisional cast on when you want to keep knitting with the stitches in the other direction at a later point. In this case, I would use them for the edging. Many knitters will use them when knitting a children’s sweater from the bottom-up; it means that they can easily add length later by picking the stitches back up and knitting down in the other direction. Thank you, Vi! I’m glad that you are enjoying the blog! Whoa…this is brilliant! I have no trouble using a crocheted provisional cast-on, but I can certainly see the advantages to this approach. I look forward to trying it…thanks for sharing! Hi Kelly! Let me know if you like this approach. I am so impressed with TECHKnitter; how can one knitter know so much? When I grow up I want to be her. Of course, it’s brilliant. Thanks for sharing that nugget! (And as soon as my Viajante is finished, I’m casting on Purl Soho’s Bobble Sheep Pillow, just because the Rams and Yowes need company, plus I don’t have enough whimsy in my life. It uses a provisional cast-on, so I’ll keep you and TECHknitter in mind when I start). Oh, I hadn’t seen the bobble sheep pillow! So cute!